Our company offers U J Cross which is used to join different parts in automobile. 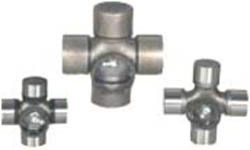 This Universal Joint Cross is available in various designs and shapes that is depend on its requirements. Our joint crosses are produced with latest technology by using superior quality of zinc and steel. These are high corrosion resistant and also have high tensile strength which helps to increase performance. Our organization is backed by rich industry experience of 16 years in the respective domain of work. This has enabled in offering an extensive range of ETP & MAV Keyless Bushes. We are a supplier,trader and distributor of Keyless Bush, Metal Bellow Couplings, Magnetic Couplings, Flexible Coupling, Needle Bearing, Poly V Belts and many more. These products are imported from some of the prominent European manufacturers, who have developed the most comprehensive and quality range of gear boxes in different versions. We work in tandem with the manufacturers for designing and selecting the best model for their particular usage. We have introduced some of the highly successful and innovative products from Europe in the field of Mechanical Power Transmission, to the Indian Industry. Before our range is procured these are pre inspected at manufacturer premises to ensure that the products we procure stands high on quality. By maintaining consistency in terms of quality, services and performance and our through our viable network of distributors all over the country we have been able to successfully establish a bond of trust and goodwill amongst our customers.